The Rain Barrels and Garden initiative informs residents how to acquire and install rain barrels and rain gardens. This initiative builds off of current efforts done by the Muncie Sanitary District. By installing rain barrels and rain gardens residents will conserve water, reduce pollution from stormwater runoff, save money on water and sanitary bill, and be eligible for a money saving tax credit. Using stored rain water and properly placing rain gardens, will allow water to absorb slowly into the ground replenishing groundwater supplies. These approaches decrease the volume of storm runoff, and help moderate stream erosion and the resulting pollution that impairs waterways. Large amounts of stormwater runoff come off roofs every time it rains and travels and picks up pollutants on the way to the White River through a storm drain. The average roof collects an estimated 22,500 gallons of rain a year. That’s enough to fill over 345- 65 gallon rain barrels a year with free water! Capture all of this free rainwater to water house plants, flower and vegetable gardens, mop your floor, wash your car, etc. Plants prefer rainwater instead of treated tap water. Additionally catching water in a rain garden allows it to slowly filter into the ground. This means less rain water is lost into your storm sewers which also means there is less flooding and erosion into our river and streams. Keeping water on your property and letting it percolate into the soil which also means more water is available to recharge the water table underground. These approaches to water management reduce flooding in yards and basements, by collecting the water and using it for watering plants or slowly releasing it and allowing it to sink into the ground. Provide plants with nutritious water. Unlike treated water, which is “softened” with dissolved minerals, rain water is naturally soft. Save money and water! Reduce water bill and sewage bill. Protect local rivers and streams. To maximize water conservation benefits, rain barrels and gardens could be planned together. Once rain barrels are full, overflow water could drain to rain gardens. Residents interested in installing rain barrels, rain gardens, or both should read the following steps and call Jason Donati, Stormwater Educator, for more information. Check the Facebook event page for upcoming events for information and chances to receive rain barrels. 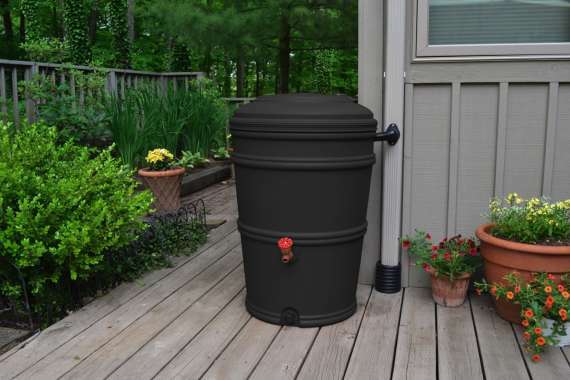 Rain barrels can also be purchased from Earth Minded Consumer Products. Once rain barrel has been acquired choose installation location. Place and level barrel on cinder blocks. Ensure steady footing. Cut downspout 18” above barrel or install shorter piece from guttering. Add Flex-a-spout and attach to downspout adapter in top of barrel. Connect 4” corrugated drainage pipe to overflow port. Direct hose away from your foundation. Allow a minimum hose length of 2 feet for crawlspace and 6 feet for basements. Attach garden hose or spigot to shut off valve at bottom of barrel. Disconnect the barrel from the downspout during winter and return to original configuration. It is important to locate rain gardens where they will collect the most amount of rainfall runoff possible. Placing your rain garden downhill from paved surfaces where water would naturally flow will maximize its ability to collect runoff. Rain Gardens are versatile; they can be any size or shape imaginable. It is most practical to locate your rain garden on level to moderate slopes. The most logical location for your rain garden is in an existing low spot in your yard. However, do not place your garden in an area where water currently ponds. Standing water shows you where the soil is slow to absorb water. The rain garden’s function is to aid in water infiltration. Be sure to place your rain garden at least 10 feet from buildings to keep water from seeping into and damaging the foundation. Collecting rainfall from your rooftop is easy, too! Just place your garden where downspouts will drain into it, directing water with a shallow swale if necessary. You may also choose to drain your downspouts to your rain garden through a buried 4” plastic downspout extender like ones you can find at most home improvement stores. Native plants are a natural for this landscape application because they tolerate short periods of standing water, are drought tolerant, and their deep roots make it easy for water to move down into the soil. 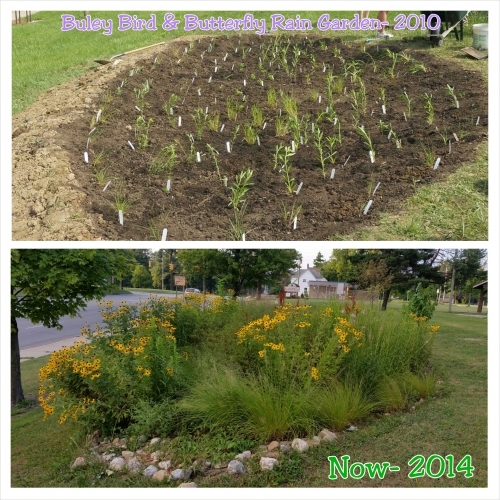 Rain gardens should only contain native plants. Native plants are great at: conserving soil and water, serving as non-polluting landscapes because they don’t need fertilizers, pesticides, or herbicides, supporting a diversity of wildlife by improving their habitat, reducing long-term maintenance after plantings are established, lasting longer because they are winter hardy, drought tolerant, and are less prone to destructive insects and diseases. When choosing which natives are best for your rain garden, consider height, wildlife attraction, flowering and sun/shade tolerance. Consult the included planting guides for sun and partial shade plant recommendations that attract birds and butterflies. Once location and plants are selected start by digging a 4-8” depression with gradually sloping sides as large in circumference as you like. (A good rule of thumb is to size your garden at 30 percent of the area of the roof from which it will be collecting water.) A 4-8” depth will allow water to be captured, but will dry between rain events. If you prefer to hold water in your garden in drier times, dig a portion a little deeper, say 18” in depth. Test your soil’s ability to hold water by filling the hole with water. If it drains out, you may want to install a plastic liner where you want ponding and install the plants around the liner. Next plant native plants. Plants can be acquired from Spence Restoration Nursery. Spence Restoration Nursery only sells to wholesale accounts but periodically sells around Muncie, dates and times can be found on the Spence Restoration and Nursery FaceBook page. Finally, add untreated, shredded hardwood mulch to a depth of 3” on all of the bare soil around the plants to prevent erosion while your natives are establishing. Additional information on raingardens and barrels. An interactive map showing where these methods have been implemented throughout Muncie. Local nursery that helps residents design and acquire plants for raingardens.